I have two Middies, a Jackie Ramone (Kitty Brighton) and a Yellow Marshmallow (Lydia Melbourne), and I may play favourites with them. Jackie Ramone was one of the first dolls that I ever truly did grabby-hands towards my computer screen when I first saw her stock photo. Plus she was set up to be Punkaholic People’s little sister and I have a Punkaholic People Blythe doll – so it just meant to be (and a necessary doll purchase). At the time that I got her, I was watching the Lizzie Bennet Diaries on YouTube so I named her after a Bennet sister from Jane Austen’s Pride and Prejudice, and a city that I have never been to before in my life. When I got Yellow Marshmallow, it was the first time that I carried on with a naming theme as I named her after another Bennet sister from Pride and Prejudice and another city that I have never been before in my life. Lydia also happens to be one of my favourite sisters from the Lizzie Bennet Diaries (even though I’m not particularly fond of her in the original novel). Having Middies is a bit of a challenge. 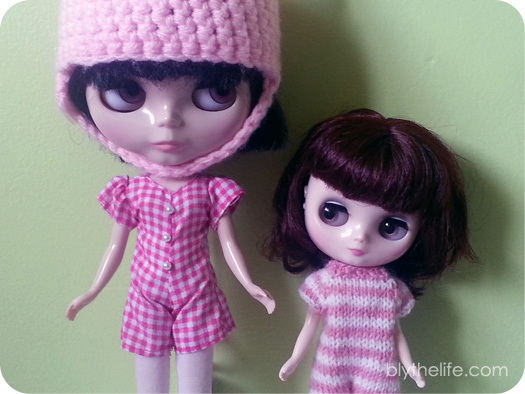 As someone who had previously only had Blythe dolls and had amassed a fair bit of clothing and shoes for them, clothing Middies is a challenge. And finding shoes! I’m sure by now everyone knows how much I adore tiny shoes – this goes for Middie-sized foot wear as well and it can be hard to find things that fit well and look cute. I’ve taken to making my dolls be more well-dressed for doll meets now, complete with (potentially) tights or socks and shoes. In the past, I’ve just swapped out dresses and popped dolls into carry bags. I’ve also just taken dolls off the shelf in whatever outfit they’d been wearing for six plus months and hoped that nobody notices (and if anyone does, they are very kind not to comment on it). While Middies may not get as much love as Kenners or Neos do, I feel that sometimes it’s just because there’s not as many options for clothing and shoes as their bigger sisters. The pint-sized darlings are just the same level as cute, but more concentrated. I may not be the biggest Middie fan in the world (because, lets face it, being able to change eye colours is just that much more awesome), but I do appreciate them and their pocket-sized cuteness! I have the same thing – not enough Middie clothes! 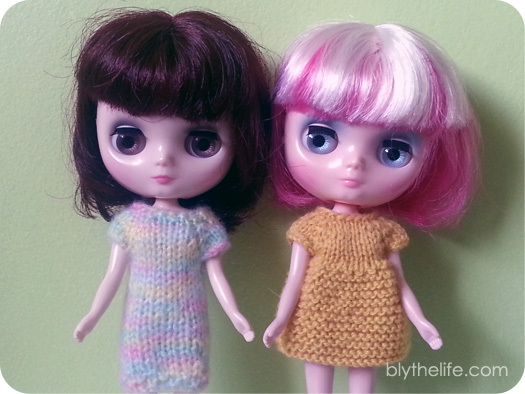 I have been designing some sweaters and working on a few sewing patterns for dresses, but prototyping is time-consuming so it doesn’t have the instant gratification I’m used to with crafting for Blythe. 🙂 I definitely want more shoes, too, but finding them is such a challenge! Shoes would be either Kelly’s or Chelsea’s shoes. They fit Middie perfectly. I have been making Middies clothes on my own. At Target, Mini Our Generation, clothes do fit Middie, you might want to sew up a little bit on waist. It would not fall if you do not sew it up. I can send you a photo of it.